Join us for this awesome party cruise! Our riverboat, the River City Star, has been a unique feature on the Omaha riverfront since the spring of 2009. We strive to offer visitors and residents of Omaha a unique riverboat experience on the Missouri River. This 3-hour cruise will travel along the Missouri River while soaking up the scenery at a relaxing, rhythmic pace. Come Together, a Beatles tribute band will be onboard to provide your entertainment! This is a 21+ only event and is a concert style cruise. •Soaking in beautiful scenery along the Missouri River, the Omaha Riverfront, Freedom Park Naval Yard, and cruising under the Bob Kerrey Pedestrian bridge. 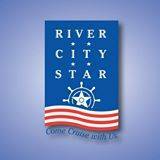 Whether you are a visitor or resident of Omaha, our unique River City Star riverboat experience makes a wonderful memory for guests to take home with them! Looking forward to having you onboard!